Location: Choose one that's three or four feet back from the previous night's peek for the tide line. You can usually tell the tide line by looking for a line of debris such as ocean plant residue or a shelf of sand that was carved by the water. Use Plenty of Water: Follow the rule, "Add sand to water, not water to sand." 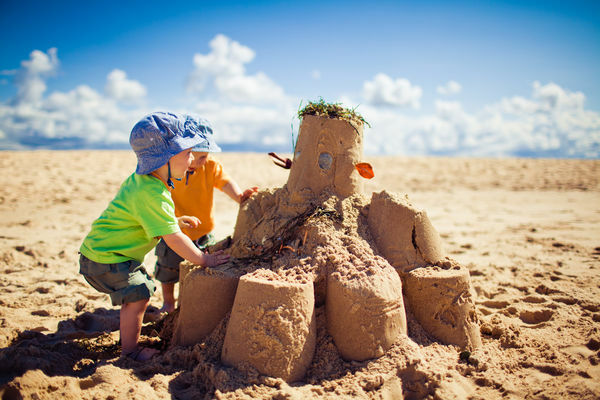 A great foundation starts with plenty of water, so have the kids start hauling buckets of water and have them pour it onto the dry sand that you want to build on. Assign one person to start piling the wet sand up and begin packing it as high and wet as possible. Once the pile is the desired height (usually two to four feet) start pouring a 50/50 mixture of sand and water from each pail. If blended properly, it will pour like mud and start to firm up within a few seconds. You are now ready to mold the structure into the basic shape you've decided to create. Carve from the top down. Visualize your desired creation as you start to carve and remove anything that's not in your design plan. You can create bricks or stones by cutting lines then blowing out the loose sand with a straw (make sure your eyes are covered to prevent getting sand in them). Preserve your creation for a while longer by spraying bottled water over the entire castle or sculpture.